Product #60790 | SKU 996358005 | 0.0 (no ratings yet) Thanks for your rating! 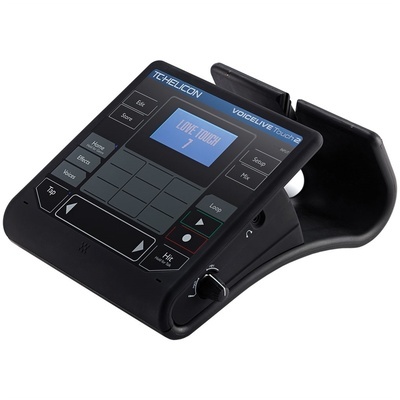 The VoiceLive Touch 2 from TC-Helicon is a mic-stand mountable vocal effect processor pad that features a plethora of vocal effects, harmony and pitch correction and a 6-track looper. It is equipped with a touch pad matrix and a touch slider, allowing for control and modulation of effect parameters in real-time. The VoiceLive Touch 2 offers studio-like vocal effects that can be used in a live or practice setting. These effects include compression, AEQ, de-essing, stutter and chop effects, harmony, natural pitch correction, hard vocal tuning effects, reverbs, delays, doubling, and more. The unit's phrase looper allows you to create 6-track compositions and apply effects to your loops including reverse, filter, slow speed, and more. The LoopAssist feature offers metronome and quantise to help ensure your loops are each locked in with the tempo.